When you are trying to decide if you should hit the road for a long period of time (maybe go full nomad) or maybe just extend your current travels, is it just a numbers game? Tune in to hear how it might be for some of you... Today you get a value packed interview with my new friend Paul Kortman. He and his family (wife, 4 kids, and 2 dogs) have been living out on the road for the last 3 years. They spent a year flying around the world and are now living in an RV. You can follow their adventure ... See More at Home Along the Way. And they have a podcast called Nomad Together. You'll Learn: How to fall into Location Independence Recommendations before taking a long term family trip Key lessons and tips on how to live in a 37ft RV with your wife, 4 kids, and 2 dogs Ways to create deeper relationships (on the road) How to run a business from your RV The fastest way to go location independent How to get a partner on board for travel What to do about medical and health issues How the hybrid location independent model can benefit you What can open your kids to an entire world of possibilities And a ton more! 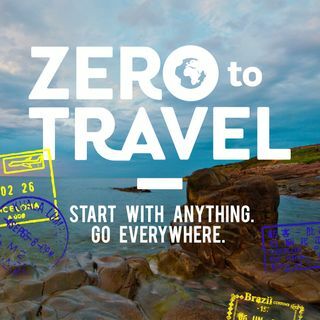 Be sure to pick up the bundle of world-class educational products from travel and location independent experts at zerototravel.com/paradisepack (The Paradise Pack is only available from May 30th- June 5th, 2017). Resources: The Paradise Pack Family Freedom- A Guide to Becoming a Location Independent Family *included in the 2017 Paradise Pack A Better Life for Half the Price *included in the 2017 Paradise Pack Nomad Together Home Along the Way Location Indie Tropical MBA Podcast Connex Digital Marketing Squarespace Logo Maker Be sure to check out the archives for more Zero To Travel Podcasts.